Then, also on television, I watched as a small bulldozer hopelessly clawed through the rubble of my neighbourhood mosque. I grew up around that mosque. I spent many hours there with my grandfather, Mohammed, a refugee from historic Palestine. Before grandpa became a refugee, he was a young Imam in a small mosque in his long-destroyed village of Beit Daras. Mohammed and many in his generation took solace in erecting their mosque in the refugee camp as soon as they arrived in the Gaza Strip in late 1948. The new mosque was first made of hardened mud but was eventually remade with bricks, and later concrete. He spent much of his time there, and when he died, his old, frail body was taken to the same mosque for a final prayer, before being buried in the adjacent Martyrs Graveyard. When I was still a child, he used to hold my hand as we walked together to the mosque during prayer times. When he aged, and could barely walk, I, in turn, held his hand. But Al-Masjid al-Kabir – the Great Mosque, later renamed Al-Qassam Mosque – was pulverised entirely by Israeli missiles during the summer war on Gaza, starting July 8, 2014. The Israeli military targeted hundreds of Palestinian houses of worship in previous wars, most notably in 2008-9 and 2012. But the 2014 war was the most brutal and most destructive yet. Thousands were killed and more injured. Nothing was immune to Israeli bombs. According to Palestine Liberation Organization records, 63 mosques were destroyed and 150 damaged in that war alone, often with people seeking shelter inside. In the case of my mosque, two bodies were recovered after a long, agonising search. They had no chance of being rescued. If they survived the deadly explosives, they were crushed by the massive slabs of concrete. In truth, concrete, cement, bricks and physical structures don’t carry much meaning on their own. We give them meaning. Our collective experiences, our pains, joys, hopes and faith make a house of worship what it is. Many generations of French Catholics have assigned the Notre Dame Cathedral with its layered meanings and symbolism since the 12th century. While the fire consumed the oak roof and much of the structure, French citizens and many around the world watched in awe. It is as if the memories, prayers and hopes of a nation that is rooted in time were suddenly revealed, rising, all at once, with the pillars of smoke and fire. But the very media that covered the news of the Notre Dame fire seemed oblivious to the obliteration of everything we hold sacred in Palestine as, day after day, Israeli war machinery continues to blow up, bulldoze and desecrate. It is as if our religions are not worthy of respect, even though Christianity was born in Palestine. It was there that Jesus roamed the hills and valleys of our historic homeland teaching people about peace, love and justice. Palestine is also central to Islam. Haram al-Sharif, where al-Aqsa Mosque and The Dome of the Rock are kept, is the third holiest site for Muslims everywhere. Christian and Muslim religious sites are besieged, often raided and shut down per military diktats. Moreover, the Israeli army-protected messianic Jewish extremists want to demolish Al-Aqsa, and the Israeli government has been digging underneath its foundation for many years. Although none of this is done in secret; international outrage remains muted. Many find Israel’s actions justified. Some have bought into the ridiculous explanation offered by the Israeli military that bombing mosques are a necessary security measure. Others are motivated by dark religious prophecies of their own. Palestine, though, is only a microcosm of the whole region. Many of us are familiar with the horrific destruction carried out by fringe militant groups against world cultural heritage in Syria, Iraq and Afghanistan. Most memorable among these are the destruction of Palmyra in Syria, Buddhas of Bamyan in Afghanistan and the Great Mosque of al-Nuri in Mosul. Nothing, however, can be compared to what the invading US army has done to Iraq. Not only did the invaders desecrate a sovereign country and brutalise her people, but they also devastated her culture that goes back to the start of human civilisation. Just the immediate aftermath of the invasion alone resulted in the looting of over 15,000 Iraqi antiquities, including the Lady of Warka, also known as the Mona Lisa of Mesopotamia, a Sumerian artefact whose history goes back to 3100 BC. I had the privilege of seeing many of these artefacts in a visit to the Iraq Museum only a few years before US soldiers looted it. At the time, Iraqi curators had all precious pieces hidden in a fortified basement in anticipation of a US bombing campaign. But nothing could prepare the museum for the savagery unleashed by the ground invasion. Since then, Iraqi culture has mostly been reduced to items on the black market of the very western invaders that have torn that country apart. The courageous work of Iraqi cultural warriors and their colleagues around the world has managed to restore some of that stolen dignity, but it will take many years for the cradle of human civilisation to redeem its vanquished honour. Every mosque, every church, every graveyard, every piece of art and every artefact is significant because it is laden with meaning, the meaning bestowed on them by those who have built or sought in them an escape, a moment of solace, hope, faith and peace. On August 2, 2014, the Israeli army bombed the historic Al-Omari Mosque in northern Gaza. The ancient mosque dates back to the 7th century and has since served as a symbol of resilience and faith for the people of Gaza. As Notre Dame burned, I thought of Al-Omari too. While the fire at the French cathedral was likely accidental, destroyed Palestinian houses of worship were intentionally targeted. The Israeli culprits are yet to be held accountable. I also thought of my grandfather, Mohammed, the kindly Imam with the handsome, small white beard. His mosque served as his only escape from a problematic existence, an exile that only ended with his death. 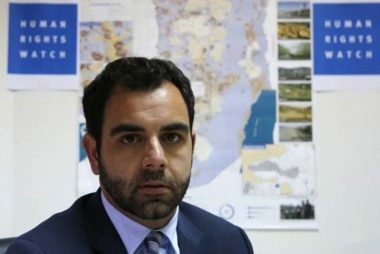 The Palestinian Center For Human Rights (PCHR): In a new and unprecedented move, an Israeli Court on April 16, 2019 has decided to uphold the revocation of the work permit of Human Rights Watch (HRW) Israel and Palestine Director, Omar Shakir, ordering him to leave the country within 14 days based on allegations that he supported a boycott of Israel. The ruling was based on a lawsuit filed by Human Rights Watch in May 2018 to challenge the decision of the Israeli government to revoke the work permit of Omar Shakir, who assumed his role as Director of HRW in Israel and Palestine in October 2016, as well as the law upon which the ruling is based, the anti-boycott law, a 2017 amendment to Israel’s Law of the Entry which bars entry or the grant of residence or work permit to foreign nationals who allegedly support the Boycott, Divestment and Sanctions (BDS) movement. The court found that Shakir has “continuously” been calling for boycotts of Israel, citing his student activism as well as his subsequent work for HRW particularly through his social media posts. The court found as “boycott-promoting activities” HRW’s research on the activities of businesses such as Airbnb, Booking.com, and Fifa, and its recommendations that they crease operating in settlements in the West Bank as their continuation will make them complicit in violating Palestinians’ human rights and constitutes a flagrant violation of international humanitarian law. Moreover, the court held that the anti-boycott law applies equally to boycotts directed at Israel and those directed at the settlements. This ruling sets a dangerous precedent and is a reflection of the shrinking space for human rights defenders, who work on monitoring and documenting violations of international humanitarian and human rights in the Occupied Palestinian Territory (OPT). In recent years, particularly in the aftermath of 2014 Operation Protective Edge in Gaza, Israel has increasingly targeted civil society organizations and human rights defenders, particularly those who have submitted evidence to the ICC, including PCHR, by launching attacks in the form of false accusations, defamation, and smear campaigns intended to undermine their legitimacy, silence their independent voices, and limit their donor funding. The rights and responsibilities that protect the work of human rights defenders are well-entrenched in international law. Among other primary human rights instruments, the Universal Declaration on Human Rights and the International Covenant on Civil and Political Rights have proclaimed the inalienable freedoms of opinion and expression, and movement. Those foundational instruments do not only champions all people rights, but also the activities of human rights defenders. Furthermore, the Declaration on Human Rights Defenders, adopted by the General Assembly in 1999, provides a range of rights and protection for human rights defenders and imposes duties and responsibilities on states to protect them even if they are openly critical of government entities, policies, or actions in the name of promoting and protecting human rights (Article 12). The Palestinian Center for Human Rights (PCHR) condemns the measures taken against Omar Shakir, whose case represents the latest assault by Israel on human rights defenders. PCHR calls upon the international community to pressure Israel to abide by its obligations under international law by taking measures to repeal the 2017 amendment to Israel’s Law of the Entry and to cease hampering the work of human rights defenders and organizations. The Palestinian Prisoners’ Society (PPS) has reported that Israeli soldiers abducted, Monday, at least eleven Palestinians, including three children, from their homes in several parts of the occupied West Bank. 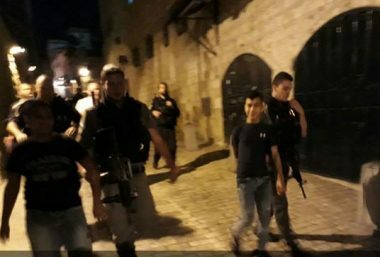 The PPS office in Bethlehem, south of occupied Jerusalem, said the soldiers stormed and ransacked several homes, and abducted four Palestinians, identified as Anan Ahmad Abd-Rabbo, 18, Yazan Khaled ‘Ayesh, 16, Firas Omar al-Jo’eidi, 28, from Beit Jala city, in addition to Moath Hasan ‘Oweina, from Battir town. Furthermore, the soldiers abducted a young man, identified as Qassam Faisal Abu Seriyya, from his home in Jenin refugee camp, in the northern West Bank governorate of Jenin. In Tulkarem, also in northern West Bank, the soldiers abducted Morad Fathi Mousa, 40, from Shoufa village, east of the city. In Qalqilia, in northern West Bank, the soldiers abducted Abdul-Qader Thiab, after storming his home and assaulting him along with his family, in addition to illegally confiscating cash from the property. His brother, Sa’id, 30, is a political prisoner who is serving a term of 30 years in Israeli prisons. In addition, the soldiers abducted Ashraf Abdul-‘Al Qattawi, from Balata refugee camp in Nablus, in northern West Bank, after the army invaded and under-construction home, where he worked, in Rojeeb village, east of Nablus. In Kobar town, near the central West Bank city of Ramallah, the soldiers abducted Nawras Mohammad Abu Khattab, 18. In occupied Jerusalem, the soldiers abducted two children from Shu’fat refugee camp, identified as Malek Nasr Houshiyya, 15, and Saleh Sharqawi, 15. Israeli soldiers abducted, on Monday at dawn, at least six Palestinians from their homes, in several parts of the West Bank, including occupied East Jerusalem. The Palestinian Prisoners’ Society (PPS) has reported that the soldiers invaded Shu’fat refugee camp, and Anata town, in Jerusalem governorate, searched and ransacked several homes and abducted two children, identified as Saleh Sharqawi and Malek Nasr Houshiyya. The soldiers also invaded Teqoua’ town, and Beit Jala city, in the West Bank governorate of Bethlehem, searched homes and abducted Anan Ahmad Hameeda. Furthermore, the soldiers abducted Abdul-Qader Thiab, and confiscated money from his home, in Qalqilia city, in northern West Bank. In addition, the soldiers abducted a former political prisoner, Morad Fathi Mousa, 40, from his home in Shoufa village, southeast of Tulkarem, in northern West Bank. On Friday April 19th Israel’s occupation forces wounded up to 100 people in its attacks against participants of the Great Return March in the besieged Gaza Strip. Among those wounded were up to 23 children, 5 women, 4-5 paramedics and 4 journalists. 42 people suffered injuries after being hit with tear-gas canisters, 33 people were shot with live ammunition and 13 were shot with rubber-coated steel bullets. One person, a child, suffered head injuries described as “critical” from being hit by Israeli occupation forces’ tear-gas canister. These are launched at high velocity from batteries mounted on vehicles. An ambulance was hit and damaged by Israeli occupation troops. Earlier in the day Israel had attacked three observation posts belonging to Hamas armed wing, the al-Qassam Brigades, without causing injuries. Both artillery and air-strikes were used in the bombing. Israeli occupation claimed that ‘shots were fired’ towards ethnically cleansed Palestine 1948 before IDF / IOF started its own attacks. The Islamic Resistance Movement, Hamas, strongly denounced the terrorist attacks that targeted hotels and places of worship in Sri Lanka on Sunday. Hamas, on behalf of the Palestinian people, extended condolences to the families of the victims and wished those injured in the attacks speedy recovery. At least 215 were killed and hundreds injured in a series of explosions inside churches and hotels in Sri Lanka on Sunday. The government of Sri Lanka announced a curfew and temporarily blocked access to several social media services following the deadly explosions. Scores of Israeli settlers on Monday morning defiled al-Aqsa Mosque in Occupied Jerusalem under police guard. Local sources said that the Israeli police in the early morning hours opened al-Maghareba Gate, which has been under Israeli control since 1967, and allowed dozens of settlers to enter the site. According to the Islamic Awqaf, Israel’s Minister of Agriculture Uri Ariel, accompanied by nearly 200 settlers, broke into al-Aqsa Mosque and performed Talmudic rituals there. Extremist settler groups have called on Israelis to flock in large numbers to al-Aqsa Mosque and pressured the Israeli police to empty the holy site of Palestinian worshipers to celebrate the Passover holiday. Gang of Israeli occupation soldiers kidnapped little Palestinian school boy in occupied West Bank city of Al-Khalil on Saturday morning. One of the teachers of the boy passed across the gang of the Israeli kidnappers and did his best to help, but the gangsters refused. The boy screamed at his teacher, appealing for help. “I swear to God that I did nothing, my teacher,” the boy said. However, the Israeli gangsters pushed the teacher away and out the boy inside the armoured military jeep and went away. 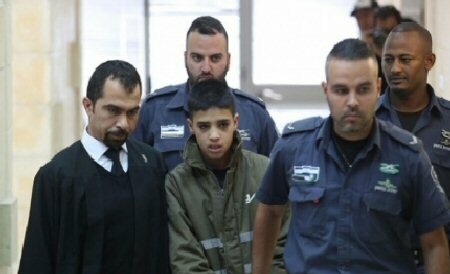 Reports from Al-Khalil said that the boy is still in Israeli custody.